Good morning everyone! I just wanted to post a note here. 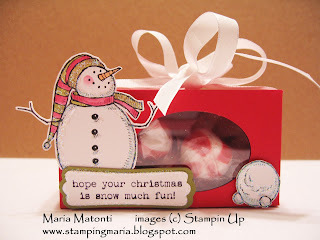 It came to my attention that a reader copied my Snowmuch Fun Treat Box and submitted it for a contest with another demonstrtor (my original post and video tutorial here). I LOVE that I can inspire people to want to make what I share, but I only ask that you do not submit my original artwork into contests. Several of my projects are ideas I get from Stampin Up or other demonstrators, but most are my original ideas that I would like to have the priviledge of submitting as contest entries. I'm not saying that my artwork is so great that it will win contests, I'm just saying that I want the choice and opportunity to enter my own work. Stamping blogs are all over the place and have been around for a long time and I've read this comment/request on so many of them. I know that once something goes out on the internet, it's "fair game", but I just figured that folks honored the "get inspired, but don't enter into contests" unspoken request. So, I'm just stating it here, you're free to copy and share my creations, just please don't enter them into contests. And if you do copy it and share it, please give credit to the creator. I don't mean to insult anyone (or "preach to the choir) and I do appreciate everyone's understanding! 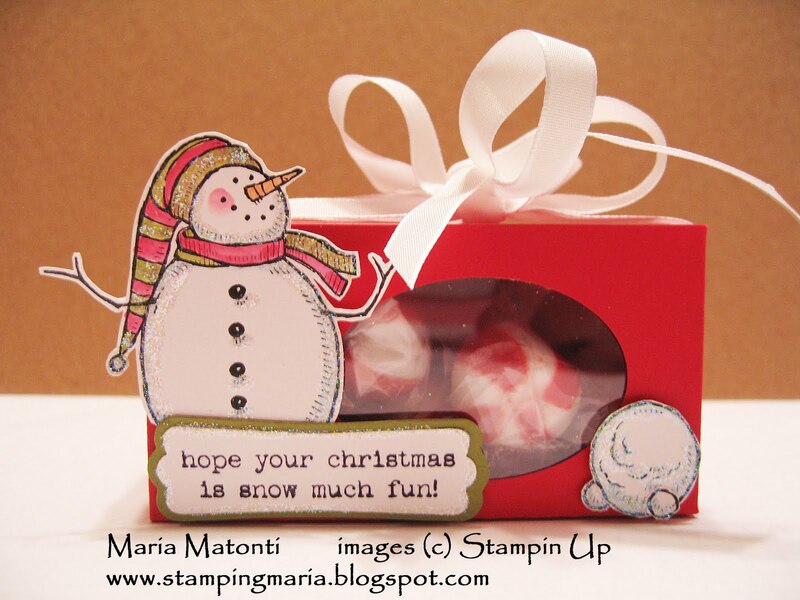 This blog is very time intensive, but I keep at it to help my Stampin Up business. I have a disability and I take care of my paralyzed mother, so I work hard at this blog to help my business grow and to meet my quarterly sales requirements. So, please help me and encourage me; God knows I need it! And frankly, if you like any of my ideas so much that you recreate it, I would appreciate you buying the materials to make the project from me (I've got to put a plug in here somewhere - ha ha)! So, thanks for "listening" and have a great weekend! This is such a sweet little gift box!!!! Thank you for sharing! I DO NOT enter contests or post anything, so no worries there about not giving credit etc! But they would be perfect for sharing gifts with friends this winter season. THANK YOU for sharing!!! !